The “Democratic Deficit” first referred to a critique from the late 1970s on how the European Economic Community ran its Parliament vis-a-vis its executive-like Commission. Canadian scholars took up the term in the 1980s and applied it here. In the Canadian context, the “Democratic Deficit” refers to the perceived lack of democratic accountability within the legislative process, due in large part to the role of the political executive enforcing party discipline, and it has also become bound up in discussions of executive federalism. The Democratic Deficit can therefore refer to a perceived lack of oversight of the House of Commons vis-à-vis the executive on matters where the executive acts in accordance with prerogative authority instead of statutory authority. It is said that the “democratic deficit” thus diminishes the role and importance of Members of Parliament. According to Julie Simmons, the “democratic deficit stems from questions about a) the impact of intergovernmental relations on responsible government and b) who can best represent the interests of Canadians – elected representatives, citizens ‘stakeholders’ or ‘policy experts.’” In addition, since these first ministers’ agreements “rarely become the subject of debate in any legislative forum”, the public hears and knows little about them, which contradicts democratic principles of transparency and accountability. Fundamentally, applying the concept of the “democratic deficit” to a critique of “executive federalism” in Canada stems from a series of misapprehensions about the nature of parliamentary government and shows the perils of privileging the normative over the factual and descriptive. Executive federalism is not best understood as an organic, informal reaction against the lack of provincial representation in the Senate, as Thomas Courchene contends. But if Courchene were correct, and if executive federalism arose from a lack of representation of the federated entities (provinces, states, cantons, or whatever) within the federal legislature, then we would expect that in a federation whose federal legislature does represent these units would not give rise to executive federalism — yet this is not what we observe in reality. Instead, executive federalism flows inevitably from the very nature of Responsible Government itself. And I can readily support this argument by comparing two parliamentary federations and sister Commonwealth Realms, the Dominion of Canada and the Commonwealth of Australia. Even though the Senate of Australia conforms to the “Triple-E Senate” model, representing the six states equally through powerful elected Senators, and enforces strong bicameralism within the Parliament of Australia, the Prime Minister of Australia and the premiers of the six Australian states and two territories still meet regularly and inter-governmentally at the Council of Australian Governments in order to negotiate, plan, and discuss issues of common concern. The Council of Australian Governments thus acts as a better entrenched version of the Council of the Federation and includes both orders of government instead of only one. The facts speak for themselves: clearly, the strong representation of federated entities within the federal parliament does not obviate the need for executive federalism within a parliamentary federation. Canadian political scientists Gerald Baier and Herman Bakvis promote “intrastate federalism” — the representation of federated entities in federal institutions — as an antidote to executive federalism. They also argue that intrastate federalism minimizes the conflict and interactions between orders of government. Of course, this is a false argument to begin with, as the Commonwealth of Australia demonstrates vis-a-vis the Dominion of Canada. But, I would also question the principle underpinning their normative argument: fundamentally, why should federated entities be represented in the federal legislature and/or executive when they have their own provincial legislatures and executives? If the federal legislature and bureaucracy are devoted to representing the federated entities at the center, then what institutions represent the federal order of government? This “Intrastate Federalism” seems to flow from (and only make sense based on) the American conception of Compact Theory: the federated entities created the federal order of government, so they are therefore entitled to representation within the structures of the federal order of government. In practice, intrastate federalism also presumes significant overlap and blending between orders of government. In contrast, executive federalism presumes a proper separation between the two orders of government: the federal legislature and executive deal with matters falling under the federal order of government’s jurisdiction, and the provincial legislatures and executives stick to matters of provincial jurisdiction. Executive federalism flows from the nature of parliamentary government, with the narrow separation of powers and balance between the executive and legislature, and also better conforms to the principles of classical federalism, the strict interpretation of the division of powers between Ottawa and the provinces. As such, it is illogical to both exalt classical federalism and criticize executive federalism. Instead, both should be praised. The confusion about parliamentarism amongst the main scholars of federalism in Canada manifests itself in other ways as well. For instance, Baier and Bakvis argue that “giving legislatures and individual legislators more power” vis-a-vis the political executive would, in and of itself, cause and encourage the Parliament of Canada to leverage “the federal spending power beyond its current limits.” In their chapter, they contemplate reforms which would empower MPs to review or scrtunize the political executive more effectively. But this particular assertion simply cannot be correct because it contradicts the basic principles of Responsible Government codified in sections 53 and 54 of the Constitution Act, 1867: money bills must originate in the House of Commons and that the Governor General must give all money bills the Royal Recommendation on the advice of Ministers of the Crown. In other words, the Royal Recommendation ensures that Ministers of the Crown (the executive) take responsibility for all proposed spending and that Parliament (the legislature), which must ultimately approve any proposed spending, controls the purse. Granting unto individual backbench MPs the authority over spending would require a constitutional amendment to abolish the Royal Recommendation, codified under section 54 of the Constitution Act, 1867. And since this authority belongs to the Governor General (on the advice of the political executive), it would require a constitutional amendment under section 41(a) of the Constitution Act, 1982 — the Unanimity Formula. It will never happen. Baier and Bakvis do not suggest amending the Constitution of Canada in this manner, but they seem to think that giving MPs more latitude from the executive would induce them to introduce money bills or that backbenchers on the government side would somehow force cabinet into spending more. Richard Simeon and David Cameron have proposed a kind of “legislative federalism”, wherein existing parliamentary committees would examine and assess inter-first minister negotiations — a feasible and minor reform which would also conform to the principles of parliamentary government because it would involve backbenchers reviewing decisions already made rather than having them introduce money bills or make policy contrary to the political executive. But Baier and Bakvis ignore these considerations and privilege federalism at the expense of parliamentarism. They also tacitly object to, or somehow find strange, the fact that the Government of Ontario, rather than the Legislative Assembly of Ontario or individual MPPs, has obtained observer status in the National Conference of State Legislatures in the United States. Of course, there is a very good reason for this: by definition, in a parliamentary system, the executive controls the legislative assembly as part of commanding its confidence, and, more crucially, the executive retains a monopoly on all money bills through the Royal Recommendation. In another collaboration, Herman Bakvis and Douglas Brown compare policy outcomes in the United States and Canada but once again overlook how the different systems of government — presidentialism versus parliamentarism — affect these outcomes and shape inter-governmental negotiations in the two countries. In other words, the degree of the separation of powers between the executive and legislature, and not the scheme for the division of powers between two orders of government, most strongly determines how inter-governmental negotiations within federations take place. They note that in the United States, the federal policy coordination comes from Congress, the legislative branch. 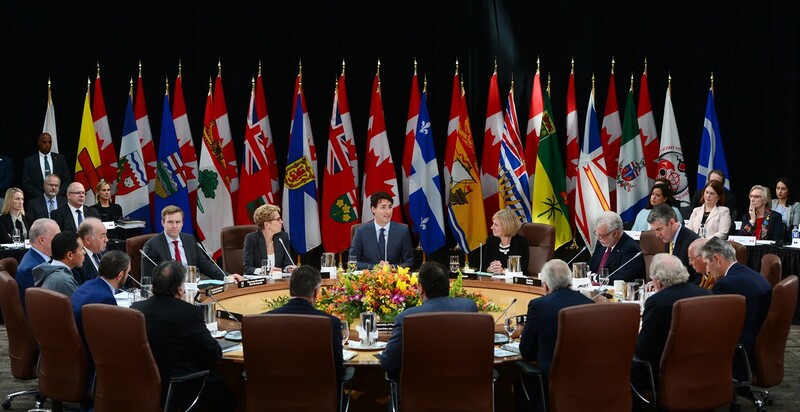 In Canada, policy coordination happens through executive conferences of first ministers, other cabinet ministers, and federal and provincial civil services. Bakvis and Brown once again fail to mention the obvious reason why the legislative branch predominates in the US while the executive branch does in ours: the difference between presidentialism and parliamentarism. Under the US Constitution, Congress holds both the power of the purse and the absolute authority to initiate any money bill. But under sections 53 and 54 of the Constitution Act, 1867, Parliament only possesses the power of the purse, while the executive must approve any money bill as a necessary condition before Parliament could pass it into law. More importantly, executive federalism is not undemocratic. It perfectly conforms to both parliamentarism and to the division of powers under the Constitution Act, 1867. While scholars like Jean-François Caron critique executive federalism and argue that inter-governmental federal-provincial negotiations are arbitrary, undemocratic, or even anti-democratic, in reality, these autocratic first ministers and other ministers of the Crown, both federally and provincially, can only remain in office when they command the confidence of the House of Commons and provincial legislative assemblies — in other words, of the people’s elected representatives. These inter-governmental negotiations are therefore entirely legitimate and can be conducted only by duly constituted governments which take responsibility for their actions. This is not true of the European Union, whose executive-like Commission consists of appointees and remains accountable to no one and to nothing, except perhaps the nebulous European “Project.” Therefore, scholars really ought to have kept the “Democratic Deficit” where it belongs, within the European Union, as a critique of the bizarre relationship between the European Commission and the European Parliament and not tried to be trendy by transplanting the term to Canadian federalism. And scholars of federalism in Canada need to be more mindful that executive federalism flows out of necessity from a parliamentary form of government, wherein ministers of the Crown take responsibility for all acts of the Crown. Gerald Baier and Herman Bakvis, “Federalism and the Reform of Central Institutions: Dealing with Asymmetry and the Democratic Deficit,” Chapter 7 in Constructing Tomorrow’s Federalism: New Perspectives on Canadian Governance, edited by Ian Peach, 89-114 (Winnipeg: University of Manitoba Press, 2007), 98. Julie M. Simmons, “Democratizing Executive Federalism: The Role of Non-Governmental Actors,” in Canadian Federalism: Performance, Effectiveness, Legitimacy, ed. Herman Bakvis and Grace Skogstad. (Toronto: University of Toronto Press, 2007): 357. Richard Simeon, Federal-Provincial Diplomacy: The Making of Recent Policy in Canada (Toronto: University of Toronto Press, 2006). Thomas J. Courchene, “Federalism, Decentralization, and Canadian Nation-Building,” Chapter 1 in The Case for Decentralized Federalism, edited by Ruth Hubbard and Gilles Paquet, 5-43 (Ottawa: University of Ottawa Press, 2010), 23. Gerald Baier and Herman Bakvis, “Federalism and the Reform of Central Institutions: Dealing with Asymmetry and the Democratic Deficit,” Chapter 7 in Constructing Tomorrow’s Federalism: New Perspectives on Canadian Governance, edited by Ian Peach, 89-114 (Winnipeg: University of Manitoba Press, 2007), 90-91. David Cameron and Richard Simeon, “Intergovernmental Relations and Democratic Citizenship,” in E.G. Peters and DJ. Savoie (eds. ), Governance in the Twenty-first Century: Revitalizing the Public Service (Montreal: McGill-Queen’s University Press, 2000). Douglas Brown and Herman Bakvis, “Policy Coordination in Federal Systems: Comparing Intergovernmental Processes and Outcomes in Canada and the United States,” Publius: The Journal of Federalism 40, no. 3: 484-507. Jean-François Caron, Guy Afforest, and Catherine Villiers-Roland, “Canada’s Federative Deficit”, Chapter 4 in Contemporary Canadian Federalism: Foundations, Traditions, Institutions, edited by Alain-G Gagnon, 132-162 (Toronto: University of Toronto Press, 2009). Once again, James, you straighten us all out!!! Well done!